We recently updated our Results section with a complete record of Kildare’s results (& scorers) at senior level in football from 1965 to 1979 and now have all results and scorers for the last 52 years. See here. Kildare’s 2013 under-21’s are rightly regarded as the most talented group of players to come out of the county for decades and now form the back-bone of a promising senior outfit (We may revisit the “promising” bit after Celtic Park). However, whereas the 2013 team had a collective shooting malfunction in the All Ireland semi-final against Galway that year, 52 years ago we had a brilliantly talented side at that level who did manage to get over the line to take national honours. Looking through the latest results archive prompted us to take a trip back to the latter half of the 1960’s, arguably the most promising period of Kildare’s history since the great days of the 1920’s and early 1930’s. We follow the story through to the end of the 1970’s in Part 2 in the coming weeks. A word of warning: there are NO happy endings here. If you think Mayo and Waterford are the GAA’s great bridesmaids you might want to re-consider. Let’s hope the current crop (and the successful minors who are following them) can prevent history repeating. In short it’s the story of a Golden Generation of prodigiously talented young men who burst on the scene in a glorious run to that All Ireland Under 21 title in 1965 and for whom senior success seemed preordained. Indeed the Nationalist of the time heralded their underage title as the “turning point in the Lilywhites’ fortunes”. Thirty seven years after their last All Ireland at senior level, the old aristocrats from the pale were back on the national stage and ready to contend once more for the game’s highest honours. Kildare had won no national titles in the intervening years since 1928 (and sadly we are still waiting a further half century on) so the under 21 achievement has a special place in our history. The player names on that team still resonate today: Ollie Crinnigan, Jack Donnelly, Pat Mangan, Pat Dunny, Tommy Carew, Kevin Kelly to name a few. On the way to the title the young Lilywhites defeated five formidable opponents in Dublin, Meath, Offaly, Down and Cork, their victories back-boned by the “amazing mobility and fitness” of their forward line which “bamboozled” the Cork defence in the final, particularly in the final 20 minutes. Kildare won the final with seven points to spare in front of 15,000 in Croke Park (2-11 to 1-7) but the game was in the balance until the closing stages. The Lilies trailed by two points at half time before surviving a Cork onslaught early in the second period. Midfielders Mangan and Donnelly were instrumental in wrestling the initiative from the Rebels while Carew was particularly to the fore after the break also. Ellistown man Donnelly scored 2-3 on a day that cemented his reputation. Senior honours seemed set to follow as a matter of course. The Nationalist proclaimed the team as the best Kildare side since 1928 and that “it will not be long before the Sam Maguire Cup comes back to one of the greatest counties in the GAA”. To be fair to the local paper, the sign-posted progression to senior honours seemed on course the following summer. Our route to the Leinster Final saw us come face to face with the holders Dublin in the semi final in Navan. Playing pragmatic catch and kick football in poor conditions, and with nine of the victorious under-21 team in the starting line-up, Kildare ran out 3-9 to 2-5 winners to qualify for a title decider with Meath. Raheens & Eire Og dual star Dunny scored a hat-trick of goals, something that no Lilywhite player has since repeated in the Championship. Pop-quiz: name the three players who have scored hat-tricks in League games since 1966 (answer at the foot of this article). Meath were a battle-hardened outfit having been champions in 1964, and the more youthful Lilywhites perhaps let stage-fright get the better of them in the first half. Meath missed three clear-cut goal chances as they over-ran the Kildare defence and should have lead by more than 1-7 to 0-3 at half time. Kildare were hanging on doggedly and finally they bought a break when Tommy Walsh crashed home a goal minutes from time to bring the gap down to one point. Kildare won a sideline from the kick out and when Donnelly was pulled down close to goal it looked like they were reprieved. But dodgy refereeing decisions for Kildare didn’t begin with Benny Coulter and Offaly referee John Dowling needed Garda protection when he blew for full time before Kildare could take the kick. Dowling had earlier denied Kildare claims for a penalty when Pa Connolly was brought down. The Nationalist argued that Dowling was not the man for such an occasion and that a referee from another province should have been appointed. The GAA took a year or two to come to the same conclusion. Meath were deserved winners though and given their relative youth this wasn’t considered as a fatal blow to the men in white. Their day would come surely. Looking back a worrying trait had emerged in that final as key players failed to “turn up” on the big day. The Nationalist gave some credit to the rhyming couplet of Connolly and Donnelly but pin-pointed under-performance from the midfield duo of Mick Carolan and Tommy Carew as key along with below-par showings from the likes of Walsh and even Dunny. Many of the same players were still eligible for the under-21’s and later that year they seemed likely to retain their All Ireland title but on this occasion Roscommon, spearheaded by a certain Dermot Early Snr (then a young army cadet serving in Kildare), pipped them by a point in the final. A certain trend was emerging with Kildare teams coming up just short in finals. Kevin Kelly took over from Donnelly as the point-scoring hero of that team while Dunny was the main goalscoring threat, grabbing two in the Leinster Final hammering of Louth and another in the All Ireland Semi Final when Kildare outscored Kerry by an impressive eleven points. Carbury’s Mangan was magnificent at midfield that day in Newbridge. Kildare had looked on course when a goal from Dunny after a fine four-man move edged them ahead early in the second half but much of the blame for the eventual defeat was put on the defence who let Roscommon in for two goals in two minutes to put the Connacht men in the driving seat with ten minutes left. Dunny could have levelled it though in the last minute but spurned the opportunity and the title was relinquished. In 1967, Kildare were favourites for the Leinster Senior title but an emerging Longford team destroyed us in a replay at Croke Park by 3-12 to 2-10, Kildare’s goals coming in a brief second half rally from Dunny and Carew. Kildare never got to grips with a mobile Longford forward line in which Jackie Devine (no relation to a later Royal nemesis Jody we assume) starred, scoring 1-4. The underage dynasty was still producing though as we secured a third successive Leinster under-21 title beating Wicklow in the final by sixteen points having already accounted for the more traditional powers of Meath and Dublin as well as Longford. 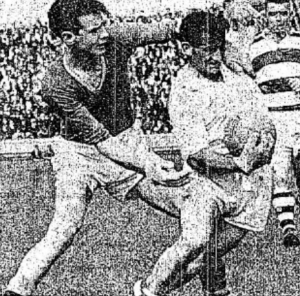 Kerry though put a stop to Kildare’s march to a third successive All Ireland final when they triunphed by 3-9 to 1-7 in the semi final to gain revenge for 1966. Five players graced all three of those under-21 sides: Crinnigan in goals, defenders Joe McTeague and Sean O’Reilly and Carew and Mangan. The juniors had also lost an All Ireland semi to Kerry that year. 1991 must have seemed like a re-run of 1968 for anyone who had the pleasure to follow Kildare in both years. In the League of 1968 Kildare were in a relatively weak group (no hierarchical Divisions back then) but beat Offaly in the Divisional Final and then Sligo in the semi final replay to reach the final against Down. Hopes were rising again. Kildare had two survivors of the 1958 final – Mick Carolan and Connolly – and seven of the 1965 under-21 side. Kildare though only had 14 players ready for the pre-match parade with Mangan a late arrival and perhaps that was indicative of their preparation levels. Down scored 1-1 to no reply in the opening minutes. A Carew goal kept Kildare in touch but Down’s second goal helped them to a four point half-time advantage. A second-half collapse seemed on the cards as Down pushed ahead by eight points but Carew again found the net as Kildare scored 1-4 in the space of six minutes to narrow the gap to one point with four minutes to go. Surely Kildare were going to finally get over the line now at senior level? Sadly the experienced Mick Carolan and his midfield partner Carew fumbled between them and Down scored from the resultant attack to break the spell. Kildare lost by 3. Still, the team had been very competitive in another senior final and surely it remained only a matter of time? That summer of ’68 proved a huge let-down though as the side suffered another really crushing championship defeat. Laois were very much also-rans in Leinster in those days but they sent shockwaves through the province by lowering the Lilywhite colours in a 3-9 to 0-9 Quarter Final win at Carlow. The damage was done in a five minute spell between the 18th and 23rd minutes when the Queens county got in for three goals. Incredibly all came from defensive blunders from Kildare. Considering Laois had reportedly not done an hour’s collective training and Kildare had been in strict group preparation since the winter, it was particularly shocking that the O’Moore men were better able to cope with the hot conditions. Kildare just didn’t stand up to the strength and pace of their opponents as question marks about their mettle were fast emerging. The hot favourites only managed two points from play as their season ended ignominiously. 1969- Upward Curve Despite Final Let Down? Kildare regrouped and again had a leisurely National League grouping (Kilkenny, Waterford and Wexford were their opponents). A hiccup with a draw against Waterford in Newbridge interupted the natural course but they beat the Deise by 36 points in a play off. A divisional semi final pairing with Laois offered an early opportunity for revenge and after a replay Kildare re-asserted their superiority over their neighbours with a 1-17 to 1-6 victory. The Divisional final was another draw (with Offaly) but Kildare collapsed once more in the replay when Donnelly was the only Kildareman to score in a 1-2 to 0-8 defeat. Remarkably that fate has befallen Kildare on just one other occasion since 1965 and curiously it was just five months later against Roscommon. It was Donnelly again who contributed Kildare’s only scores (1-1). Statistical gems aside, Kildare managed to pick themselves up magnificently in time for the championship. Seasoned Lily-watchers will notice a trend here. Positive results bring raised confidence, optimism abounds, the fan starts to think “just maybe”, and then out of nowhere a performance summoned from hell turns up from the blue (or green, white and orange perhaps). Familiar? But let’s keep it positive for a couple of paragraphs. Kildare ripped into Meath in the Leinster Quarter Final of ’69. It was a rare day in Croke Park when all of their talented individuals clicked and a polished performance destroyed the Royals. The Nationalist saw signs of a “Championship winning squad” in players of undoubted potential. Donnelly was the star performer as he embellished a glowing reputation with eight points and “even when injured he continued to sweep Meath players out of his way like juveniles”. Aside from Donnelly, Mick Mullins from Allenwood was the other scoring hero with two goals. Beating Dublin may seem like a pipe-dream these days but in 1969 Kildare were seen as favourites for the Leinster semi-final which attracted 20,000 to Carlow. This was one of Dublin’s weakest teams for some time but they had some quick forwards and there was more than a little uncertainty that the unpredictable Lilies would reproduce the form they showed against Meath. Thankfully Kildare did turn up again and were commanding 0-18 to 0-7 winners. They had the Dublin attack in a straight-jacket and with Allenwood’s Joe Doyle, normally a half-back, prominent in an attacking role, the front six were in sparkling form. Offaly awaited in the final having snuffed out Wexford in the semi-final, the Slaneysiders in turn having dethroned 1968 winners Longford. Despite the let-downs they’d regularly given their supporters, the Lilywhites went into the final as favourites once more. Taking the time-honoured line that “midfield would hold the key” the Nationalist pronounced Donnelly and Mangan as Kildare’s likely match-winners. More ominously they decreed that it was “now or never for Kildare” with “enthusiasm at its peak in the camp”. Kildare suffered an early blow when Connolly retired injured, having been doubtful for the game. The Clane full forward was the only panelist with a Leinster senior medal, earned in 1956. For twenty-five minutes, though, the game seemed to be following the script with Kildare ahead by a point, 1-5 to 1-4. Carew had scored an equalising goal within four minutes of his arrival. Sadly the game turned in the five minutes before and after half-time. Kildare lost centre-back Carolan to injury which necessitated Mangan moving to no.6 and Carew coming out to midfield. 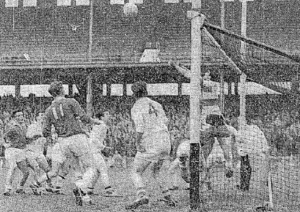 Before anyone had settled a high ball into the square ended with Mick O’Rourke, up to then well-marked by Pat Nally, slapping a rebound off Crinnigan into the net. Another high ball just after half-time created the body blow from which Kildare hopes never recovered. Corner back Joe McTeague tried to clear but the ball went dangerously across goal and Pat Monaghan shot low past Crinnigan. Offaly had day-light and were on course for their first title since 1961. That winter, Kildare got the show on the road again. A strong 1969/70 National League performance saw only one defeat (the Roscommon one referred to above: 1-11 to 1-1) but that was avenged in a play off in the Spring (2-12 to 1-4) with top marksman (from play at least) Dunny grabbing 1-5. Kildare won through to a rematch with Down in the semi-final two years on from their final showdown. Only 11,00 turned up in Croke Park due to torrential conditions. Kildare did win the midfield battle with Mangan and Donnelly on top. But Down were resolute defensively and a quick counter-attacking style was too slick for the Lilies’s defence. All this despite a goal inside a minute (a-la Niall Kelly) from Dunny. Before Kildare’s hopes could lift too much Peter Rooney had negated that goal with a soccer-style strike into the roof of the net at the other end. Despite an exhilarating first-half, with Carolan and Jack Balfe impressive in the defence, Kildare ran out of energy against the wind in the second period and Down were convincing 1-11 to 2-3 winners. Dunny was the only forward to impress for Kildare with 1-2. Visits to Croke Park for major matches were taking on a miserable tone. Not surprisingly the supporters’ ardour was a little dampened heading into the 1970 Championship, although Wicklow were not expected to put up much of a challenge in the First Round. In an attempt to shake things up a completely new half-forward line was introduced – Bernie Geraghty, Eamon O’Donoghue and Tom Fitzgerald. O’Donoghue, then of Sallins and later of Johnstownbridge, would go on to manage the team having had huge success as a player with UCD under one Eugene McGee’s coaching. 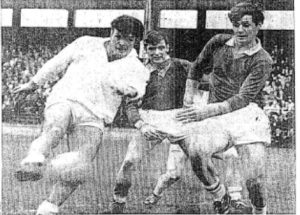 Wicklow were duly dispatched “without unduly exerting themselves” according to the Evening Herald – clearly the players hadn’t taken heed of the Nationalist’s threatened outing – by 5-8 to 1-8 with Mangan helping himself to five goals. The Irish Independent remarked that the “lack of interest of the players matched the impact the occasion evinced by the small and unenthusiastic attendance”. Let’s move swiftly on then..
Kildare struggled at times to shake off Wexford in the Quarter Final but eventually did just that with five points to spare in Croke Park. On then to a semi-final meeting with Meath. The Nationalist stuck with that tired old line of Kildare being favourites and saw Mangan and Donnelly as “vastly superior” and that Kildare on paper “completely out-gun their rivals” while acknowledging at least that “Kildare can play football not expected of juniors”. In the event they should perhaps have fielded the juniors. It was a close enough encounter and when an otherwise quiet Donnelly raised a green flag with a speculative effort from long range, Kildare edged 1-8 to 0-9 ahead and looked well set. But Meath, out in the cold since winning the All Ireland three years before, coasted through to the final whistle with four unanswered points. Kildare had crashed and burned again. How would our friends in the Nationalist sum up the Kildare performance? Predictably but more ruthlessly than heretofore they headlined with “Spiritless Lily-Whites Crash Against Meath” before going on to suggest they “may throw their hats at ever winning a senior championship”. They had “flattered too often and deceived every time”. The team’s race had run. Join us next time for Part 2 when we’ll take you through the remainder of the 1970’s as Kildare struggle to prove the Nationalist wrong !